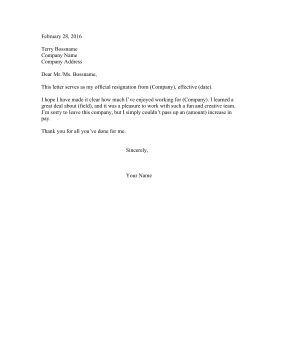 When leaving a company for another opportunity with an increase in pay, use this printable resignation letter. This letter serves as my official resignation from (Company), effective (date). I hope I have made it clear how much I've enjoyed working for (Company). I learned a great deal about (field), and it was a pleasure to work with such a fun and creative team. I'm sorry to leave this company, but I simply couldn't pass up an (amount) increase in pay.